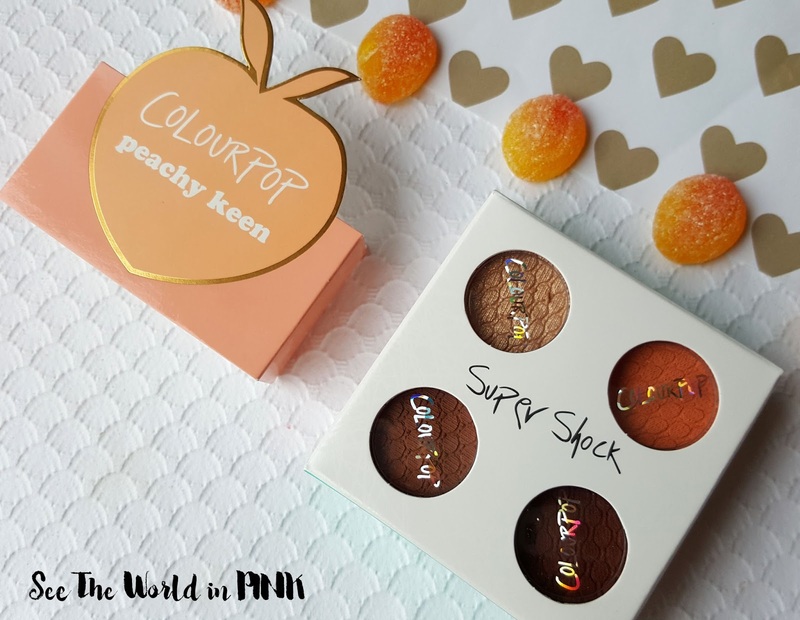 ColourPop Peachy Keen Super Shock Shadow Foursome - Reviews, Swatches, and Makeup Look! 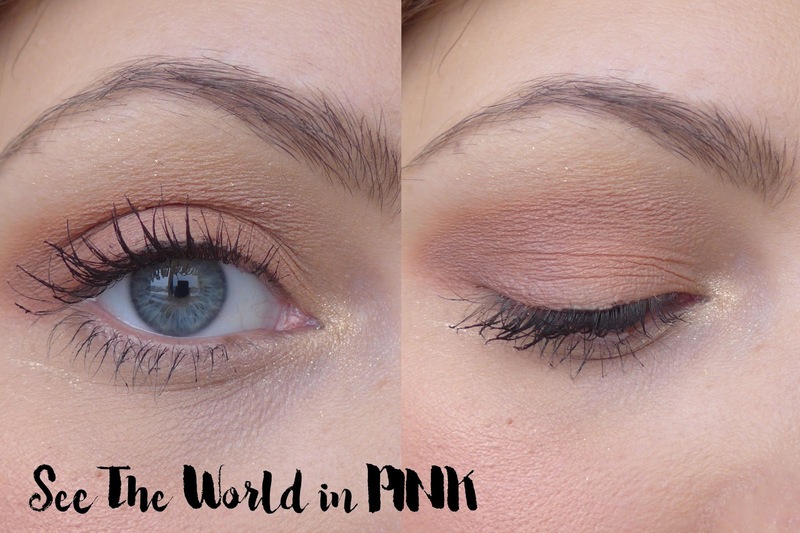 Peach is all over the makeup world this Spring! I'm not complaining - in fact, I am loving all the peach goodies! It is a flattering shade on most skin types and it's so versatile! ColourPop usually sells single eyeshadows; however, sometimes they release a 4 pack of themed shadows! 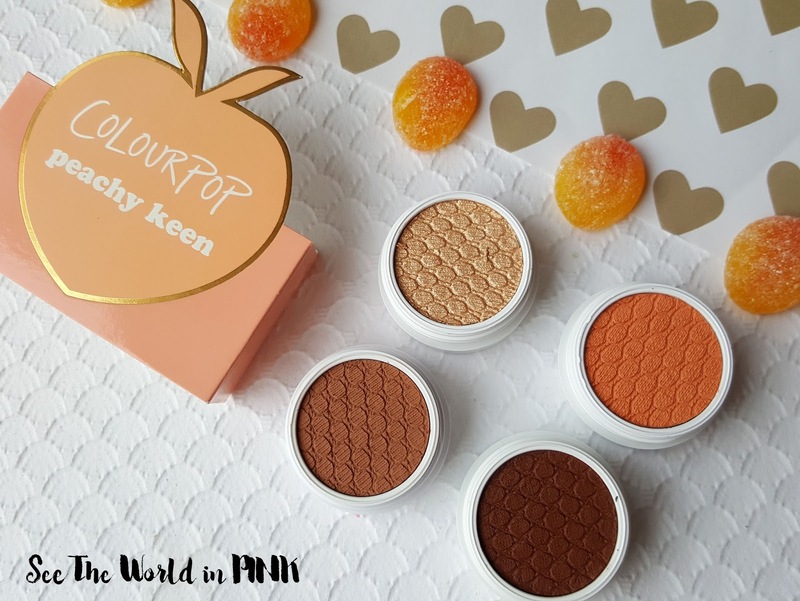 ColourPop Peachy Keen Foursome ~ $18.00. This foursome of super shock eye shadows comes in a cute package with 4 shadows: Crimper, Kennedy, Cornelious, and Bandit. Peach is everywhere for this Spring, and this little foursome is so cute! I love this quad - how amazing is Kennedy?! It is a true peach shade and it is so pretty! Also, Crimper is stunning! I am fairly happy with the swatches! Crimper is so stunning - love this bold gold with a metallic finish! Kennedy is also just as beautiful and peachy as I was expecting it to be! I really like the colour of Cornelious; however, I was expecting it to be a little darker - it is a beautiful transition colour though! Bandit is way darker than I was expecting and it doesn't quite fit in with the quad - hopefully it blends out lighter. I used Crimper in the inner corner, Cornelious in the crease, and Kennedy on the lid! I'm pretty happy with the quad - I couldn't quite get Bandit to fit with the bright, light peach look I was going for; but, I will keep playing with the quad together! 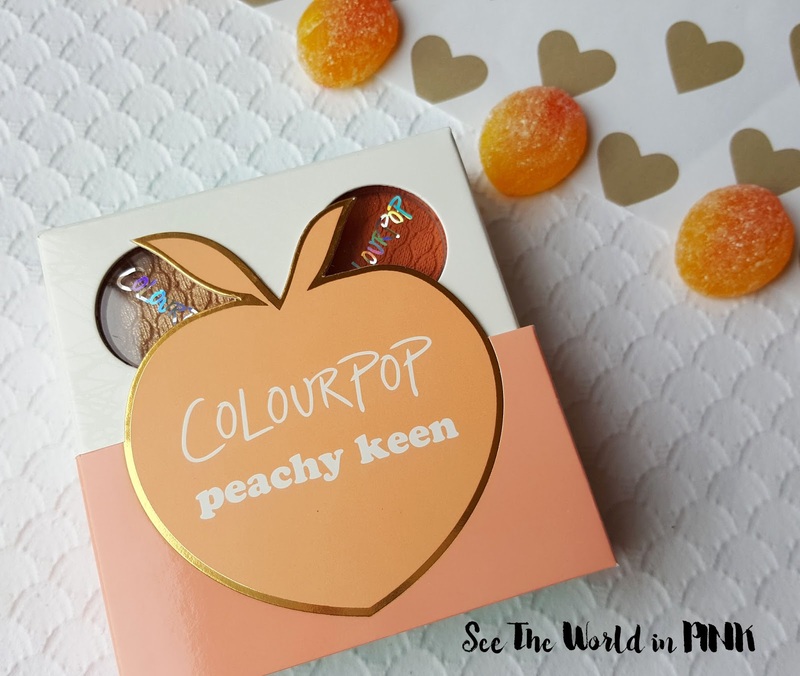 How do you feel about the Peach craze going on right now?! This is a cute little set. The colours are beautiful and I love the look you did with them. I would try using Bandit as a liner - that's what I tend to do with dark shades. Thanks Chantal! I don't know why I didn't think to use it as an eyeliner - seems the most obvious choice!